Do you have trouble sitting in a chair? Are you stuck at a desk all day? 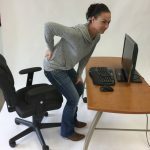 Back pain when sitting is common if you are a back sufferer, and for millions of Americans – from office workers to truck drivers and equipment operators – sitting is the job. The truth is, sitting actually puts more pressure on your spine than standing, and the toll on your back and body is even worse if you are sitting hunched in front of a computer all day. 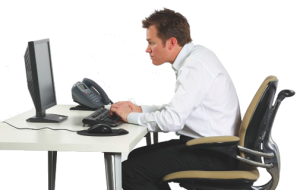 The poor posture forced by prolonged sitting in poorly-designed office or vehicle seats can also compromise circulation, especially to the feet and legs, but also to the rest of the body, resulting in increased fatigue and over time other degenerative physical problems. For professional truck drivers, farm workers and other heavy equipment operators, spinal compression is most often felt in the lower back. The second leading cause of back pain in truck drivers and equipment operators is sciatica, which is caused by a pinching of the sciatica nerve which runs through the buttock and down the back of the leg. 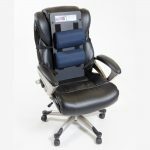 Both office workers and truck drivers need a good, supportive seat cushion and support system to both alleviate back pain, relieve fatigue, and to prevent future health issues. 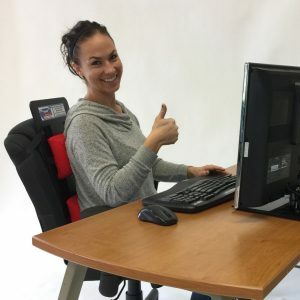 Not only does a proper seat cushion make all the difference when compared to cheap alternatives or even the seat itself by providing needed support, but it also feels more comfortable to sit for hours at a time while being more productive. But My Chair / Seat Is “Ergonomic”! Much of the hoopla about fancy body-sculpted “ergonomic” seating is nothing more than marketing hype. The truth is, all ergonomic seating is designed for two things – to look fancy and ultra-modern in the catalog, and to fit the masses. It is to back support what “off the rack” is to clothing. It rarely fits anyone well. “One size fits all” fits no one. 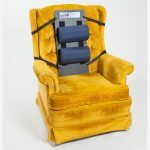 This is the most common type of chair back support marketed and sold, and while such cushions targeting the lumbar region of the lower back can be helpful, they do nothing to provide support the middle back region, which is ultimately responsible for good posture and supporting your upper torso, shoulders, arms, and neck. Simply put, if you don’t provide adequate support for the mid-back area along with your lumbar area, you will still experience fatigue, compressed nerves, a loss of strength, and compromised circulation. 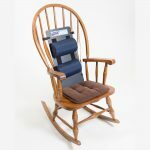 Developed by physical therapist Dr. Louis Smith for his patients suffering from back pain and mobility issues, the Backsmith™ Adjustable Chair Support System provides the answer to all of the drawbacks presented by most chair cushions on the market, issues which remain even with the sleekest and most expensive “ergonomic” chair. The back of the Backsmith™ Adjustable Chair Support System provides needed firmness and support, yet with a flexibility that adapts to your weight and movement. Unlike simple pillows or similar back support cushions, the Backsmith™ Adjustable Chair Support System pads won’t get lost by sinking in to the cushioning of your current chair. 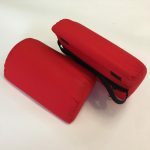 The two included support pads can be infinitely and precisely adjusted to support both your lower back AND your middle back. The industrial-strength hook and loop strips and tough elastic straps keep your cushions right where you want them, yet allow you to quickly and easily re-position the cushions to provide exactly the support you need, where and when you need it. 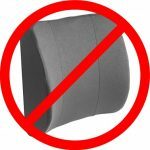 Like the pillows on your bed, the cushioning foam in the Backsmith™ Adjustable Chair Support pads will become less supportive with use over time. 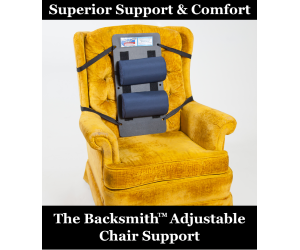 To maintain the firmness support of your Backsmith™ Adjustable Chair Support System Dr. Smith recommends that you replace your system cushions at least every 6 months. Replacement cushions are available in the Backsmith online store for easy direct shipment right to your door! The Backsmith™ Adjustable Chair Support System is made to be portable, so you can move it easily between chairs. However, many of Dr. Smith’s patients purchase multiple chair supports for their favorite easy chair, car seat, and office chair, so that they always have the support they need no matter where they are sitting! Are you or do you know someone who is confined to a wheelchair or electric scooter? Most wheelchairs have very little back support, and folding portable wheelchairs have almost none at all. 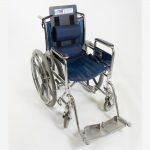 The Backsmith™ Adjustable Chair Support System customizes your wheelchair with the back support you need, increasing comfort and reducing fatigue, nerve compression, and circulatory problems. With components that are hand-made and assembled in Wausau, Wisconsin your Backsmith™ Adjustable Chair Support System is sure to last! 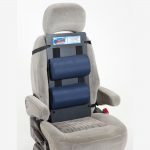 Order one TODAY for your chair or car seat! 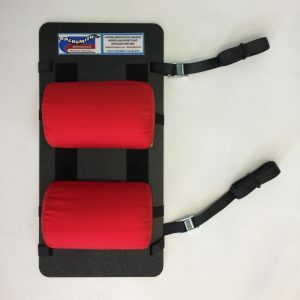 If you have back pain and need better chair support, order a Backsmith™ Adjustable Chair Support System for YOUR chair or vehicle, and see how much difference the RIGHT support in the RIGHT place makes! Most patients respond very well and significantly reduce their pain and improve their functioning and mobility through skilled evaluation, manual therapy, and progressive therapeutic exercise. Take the Backsmith Challenge! If you live in the Central Wisconsin area and you currently live with chronic pain or strength and mobility issues, call Dr. Smith today for an evaluation appointment. If you don’t see significantly improved strength in your first treatment session, the next one is FREE!